ARCATA – Arcata Main Street announced a major and risky change in this year’s Oyster Festival last week – if plans are approved, it will fence off the Plaza and charge $10 admission to attend the event. 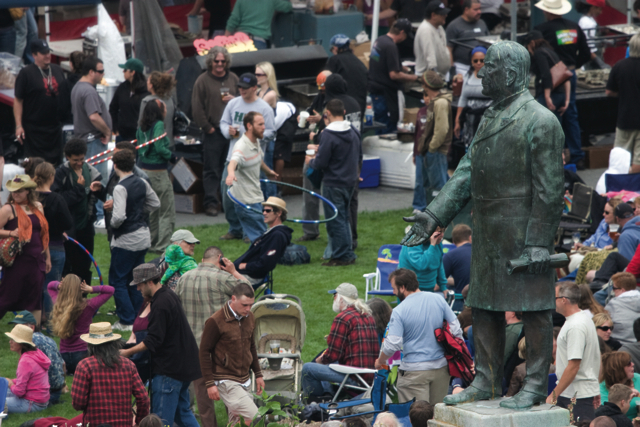 For 23 years, attendees have been able to freely enter the booth-crammed square, roam about and partake of the food, beverages, kids’ attraction, music and festive Oysterfest features. They can still do that, but they’ll have to pay their way in through one of four checkpoints at the Plaza’s corners. The plan – which, for all the furor, has not yet been approved by the City and Fire Dept. – involves installation of a temporary fence all around the Plaza. Still pending is approval of the evacuation plan and sign-off by fire and police officials. The decision to charge an entry fee came about for a number of reasons, according to Main Street officials. The fee, they say, will pay for the rest of Main Street’s events, including Halloween Trick or Treating, the holiday Season of Wonder and Light, concerts and picnics on the Plaza and more. It will also allow Main Street to detach itself from dependency on taxpayer dollars, as the City’s of Arcata’s ever-diminishing annual subsidy is now just $15,000. Enclosing the square will enable better crowd management and public safety, and, as Main Street puts it, “change the dynamic and energy of the event.” That’s code for filtering out troublemakers and drunks with the $10 entry threshold. Within hours of the Thursday announcement, Arcata Main Street Director Jennifer Koopman and her board had been reviled as greedy, incompetent, dishonest, self-interested and even anatomically mutated. “I don’t know where your head is, but it’s not on your shoulders,” one caller to Main Street said in a voice mail message. Some online commenters wove the news into a broader narrative about the dysfunctional hellscape of oppression and ruin Arcata has become. Many commenters pledged not to attend the Oyster Festival, and expressed dismay that a public facility – the Plaza – could be cordoned off from free public use. Police Chief Tom Chapman said that since the fencing approach is new and untested, the City wouldn’t change anything about the way it handles the Oyster Festival. Arcata Police will deploy additional officers late in the day, to cope with the swelling crowd and alcohol-related misbehavior. “We’re always thinking, ‘what’s the worst-case scenario and how could we handle it?’” Chapman said. That, he said, would likely be a fire or earthquake that would cause a panic and stampede. “While the possibility is remote, I’m paid to think of these things,” he said. The enclosure would be a six-foot-tall cyclone fence placed curbside around the Plaza. The original plan was to do that on all four sides, though Main Street is now modifying that concept. The north side of Ninth Street along Tavern Row will get the curbside fence treatment. But in a new twist, Koopman said that if all the businesses on a given block approve, the fence could be eliminated from out front, and limited to the ends of the block. That way, the sidewalks and businesses would only be accessible to OysterFest attendees who have paid the entry fee. One business on H Street adamantly rejected the offer, so the fence apparently will be placed curbside along the western side of the Plaza. But businesses on the east side, along G Street, are OK with the idea, so that block may not be fenced. Businesses along the south side, along Eighth Street, seem to be generally sympathetic to the idea, but unanimity has not been achieved. If the fence is eliminated on the south side, Jacoby’s Storehouse and the Golden Building (which houses Libation) will have extra security, as they have internal stairs through which people could enter the Plaza without going through a corner entry checkpoint. The cyclone fence segments will be held together with zip ties. In case of emergency, OysterFest workers will be equipped with snippers to quickly disconnect the fence segments for easy exit. Plaza merchants’ initial reactions ranged from cautious approval to harsh rejection. Todd Larsen, manager of Baroni Designs, which owns the Plaza store, said the fence might help to keep people with messy drinks and food from coming in, but that same lack of access could impact business. “It would be a shame to have 6,000 to 10,000 people on the Plaza without easy access to the businesses,” he said. Alibi owner Justin Ladd said he was “incredulous” at what he believes is an ill-considered plan and a too-high entry fee. He suggested Main Street “ease into” a new approach, perhaps offering more festivals to garner additional income. Koopman pointed out that the $10 entry fee includes a wristband for alcohol purchase that used to cost $3. So the door fee for imbibing adults is, in effect, $7. He faulted Main Street for poor messaging in terms of being seen as shutting out the public, and not working things out collaboratively with the business community in advance. He plans to close Luke’s Joint for the day and hold a counter-event featuring non-alcoholic sponsors and child-friendly features. “Keep your eyes peeled for a new festival, called ‘The Other Fest’ coming soon to a parking lot near The Other Place,” Patterson said. Koopman said the Arcata Chamber of Commerce has been briefed and supports the plan. All Plaza businesses will be given two free tickets to the event, and all Main Street members will receive four tickets. In addition, those who pay the admission fee will be given discount coupons for local businesses. This entry was posted on Wednesday, May 8th, 2013 at 1:22 pm	and is filed under News, Community, Business. You can follow any responses to this entry through the RSS 2.0 feed.